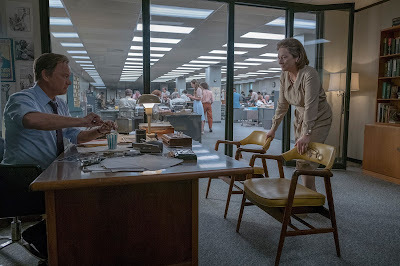 Ever since I first heard this film was going into production, I have been incredibly excited to see The Post. You have one of the greatest filmmakers of all time in Steven Spielberg directing, with two of the greatest actors to ever grace the screen in Meryl Streep and Tom Hanks leading the film. 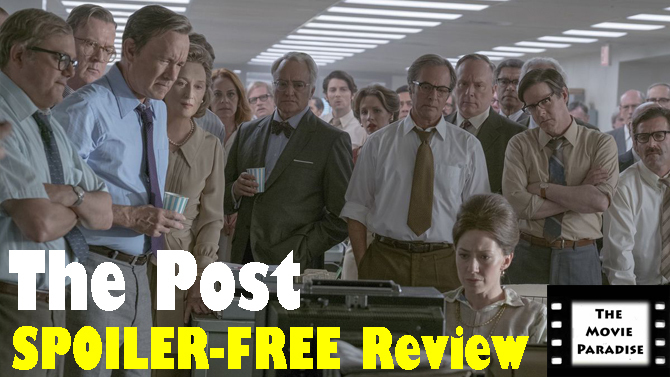 Add the fact that the story surrounds a war between the free press and the White House during the Nixon era, an incredibly timely issue, and you have all the makings for one of the greatest films of the year. 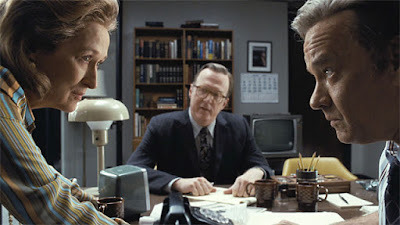 Plus, I really enjoy these kinds of investigative journalism movies, such as All the President's Men and Spotlight. And from the looks of the trailers, it seemed as if The Post could be right up there with them. There was so much potential for this movie to be a riveting drama with a topical message, and I went into it with incredibly high expectations. And, for the most part, The Post met them. While the first act is sort of slow, once we get into the meat of the story, The Post starts running and it never lets you go. Spielberg crafts an incredibly tense dramatic political thriller that is certainly one of the most important films of 2017. 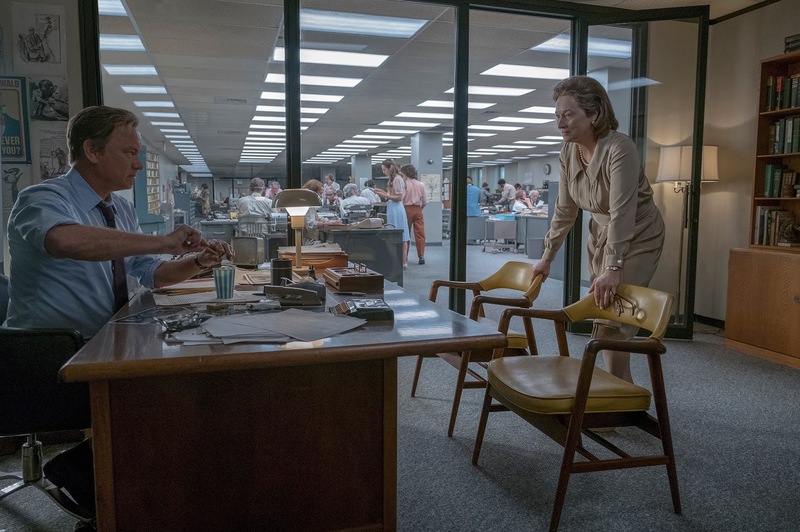 The Washington Post editor Kay Graham (Streep) must decide whether or not to publish damning papers, revealing government lies about the Vietnam War. Usually I talk about the positives of a movie first and then the negatives, but since my biggest negative concerns the beginning of the film, I think it only makes sense to address it right out of the gate. The first act of The Post is rather weak. It's not bad in any way, but it didn't grip me. I was interested enough to not check out of the film, but it didn't grab my attention the way I wanted it to; not the way the rest of the movie does. It starts with a rather slow pace, and with a lot of conversations. This is done to introduce us to the characters, but there isn't anything particularly interesting nor engaging about these first forty or so minutes. Watching this beginning part, I was afraid this is what the whole movie was going to be like: a boring, dialogue-heavy drama. But at a certain point, something major in the plot happens, and it changes everything. The pace picks up rapidly, and the film moves forward with lightning speed. While all the initial character work may have seemed tedious at first, it helps with the payoff these characters have by the end of the film. Meryl Streep and Tom Hanks' characters have major character arcs that begin in this dull part of the movie, but that setup is imperative to the arcs coming full circle by the end. Spielberg is a master director, and he could have done a better job with this first act. But considering just how electric and nail-biting the rest of the movie is, I'm able to forgive him for it. 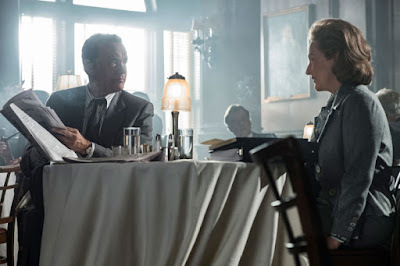 As you would expect, Meryl Streep and Tom Hanks are phenomenal. For most of the movie, I thought Streep was really good, but she wasn't doing anything much more than simply being Streep. It was a good but not extraordinary performance . That is, until a certain scene in the third act when she delivers a monologue in her child's bedroom. That's the scene you get Meryl Streep for! It takes her performance to another level, and her character finds a new sense of identity as a result of it. Tom Hanks, I find, is a little more consistent with his performance. He's excellent throughout, and I'm thoroughly convinced of why publishing this story is so important to him. But the actor who is not getting nearly as much credit as he deserves is Bob Odenkirk. I don't think he's worthy of a Best Supporting Actor nomination or anything like that, but he does a fantastic job in this film. I was expecting Streep and Hanks to be good, but I wasn't expecting Odenkirk to be just as good as he is. It was a pleasant surprise. And, of course, Spielberg does a phenomenal job directing. The first act aside, he keeps up a relentlessly electric pace. The sense of urgency he instills allows the drama to feel all the more intense, and lets the resolution be all the more satisfactory. Everyone brings their A-game to this movie, and it was great to see so many talented people come together to tell such an important story. 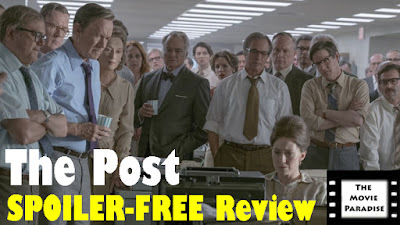 Overall, The Post is a great movie. It does have a meandering first act that does take its time to get going, but once it hits a certain point in the story, the movie doesn't look back. All the performances are great. Meryl Streep is good, but she really delivers with a specific scene in the third act. Tom Hanks is also great, being a little more consistent with the quality of his performance. And Bob Odenkirk surprises with an underrated performance that no one seems to be talking about. The film is very well written and structured to give important character arcs to Streep and Hanks' characters, ones that further the message of the film. It addresses topical issues in today's political climate without ever coming across as preachy or condescending, and is effective in its demonstration of the power of the First Amendment, and the vitally important role the press plays in a free democracy. Steven Spielberg encapsulates all of this wonderfully in a riveting drama that had me on the edge of my seat. Had the first act been just as good as the rest of the film, this probably would have been one of my top favorite movies of 2017. Even with that, however, I would still consider it one of the best films of the year, even if it is on the lower side of that list. What do you think? Have you seen The Post? If not, are you planning on seeing it? Leave your (spoiler-free) thoughts in the comments section below.